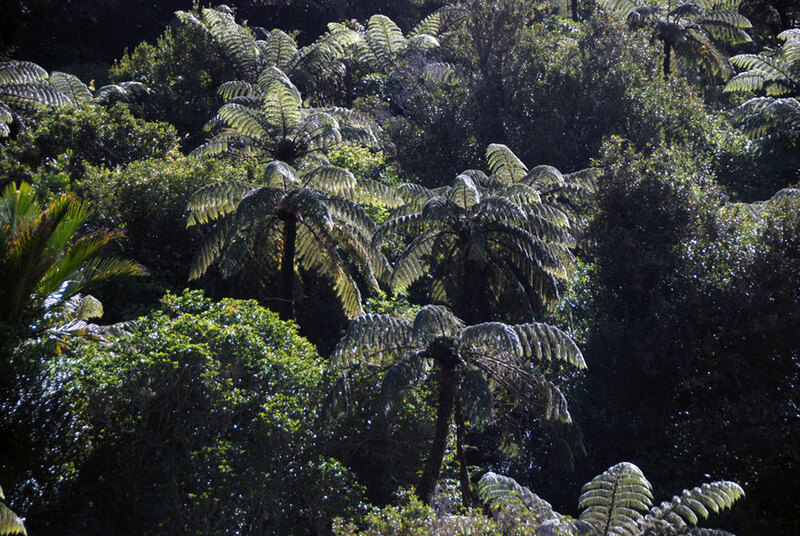 Sun filtering through tree fern dominated lowland forest in the Wainui Valley, Golden Bay. 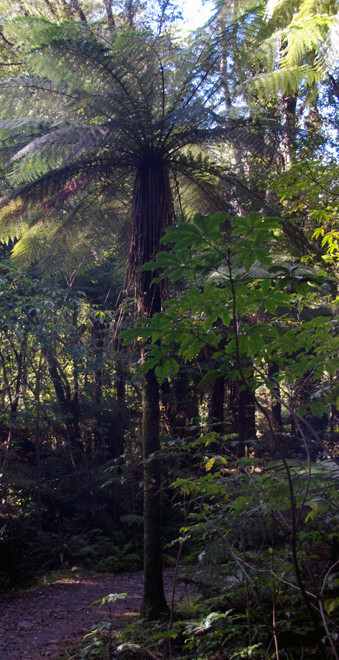 Tree ferns are one of the characteristic markers of New Zealand's biota and global presence. The Silver Fern is the national plant and adorns the All Black rugby kit and Air New Zealand's planes. It also adorned field writing kits issued to IWW sodiers and some military vehicles in the conflict (see this fascinating blog post by HistoryGeek). To the visitor they are one of the first indicators of an exotic and distinct flora that reasserts itself outside the confines of New Zealand's 'South Britain' look of the exotic (i.e. non-native) dairy pasture and sheep paddock. These ancient plants with their long fronds, distinctive crowns and intriguing 'trunks have been around for getting on for 360 milion years. The 'great fern radiation' 150 million years ago lead to the widespread diffusion and speciation of tree ferns. But like most flora and fauna they suffered in the mass extinction event at the close of the Cretaceous period (145-65 MYA). Spectacular tree fern on the Wainui Falls walk. 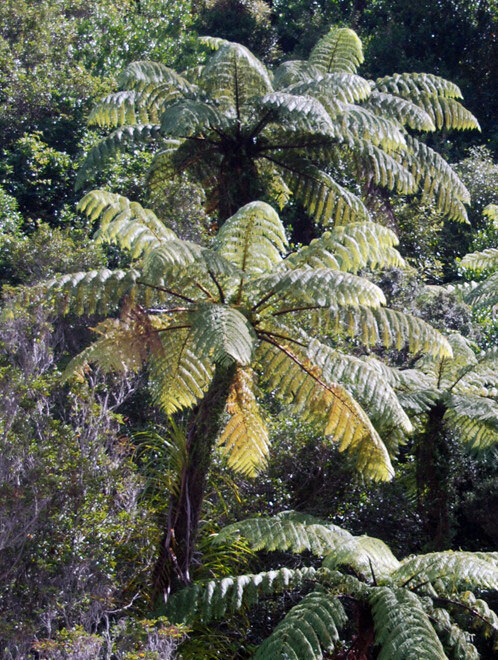 New Zealand's tree fern genera - Cyathea and Dicksonia can be traced directly back to the Gondwana supercontinent before the separation of the Zealandia mini-continent 80 MYA (see Gibbs p.91). Confined to tropical and sub-tropical zones and temperate zones in New Zealand, Tasmania and South Africa the tree ferns, like most ferns, were relegated to marginal zones by the evolutionary march of the flowering plants (angiosperms) and the naked-seed producing plants (gymnosperms - think mainly conifers, cycads - palm like tropical and subtropical plants - Gnetophytes and the solitary Gingko). 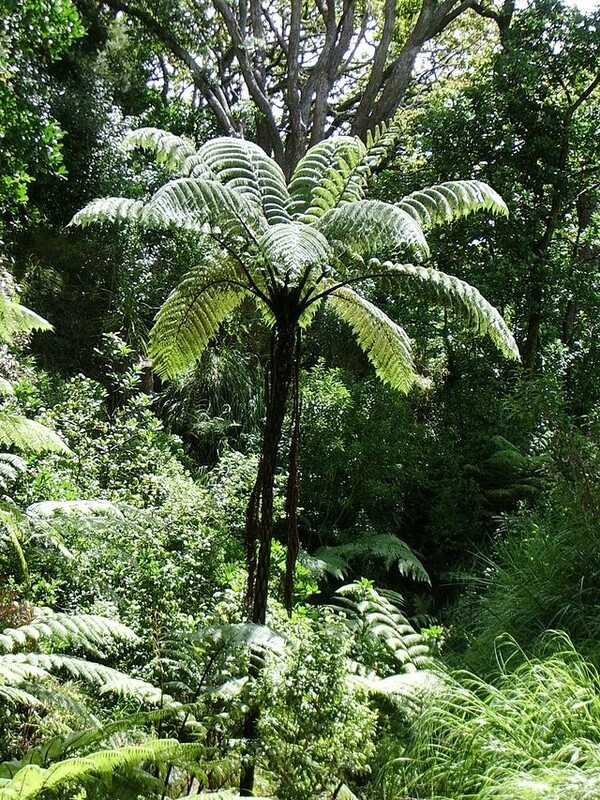 Ferns and tree ferns have generally survived in habitats where environmental factors are not conducive to seed or flower producing plants - like the damp, shady places of the forest understory and north facing slopes and poor, wet and infertile soils. Fallen Silver Tree Fern frond on the Wainui Falls walk. 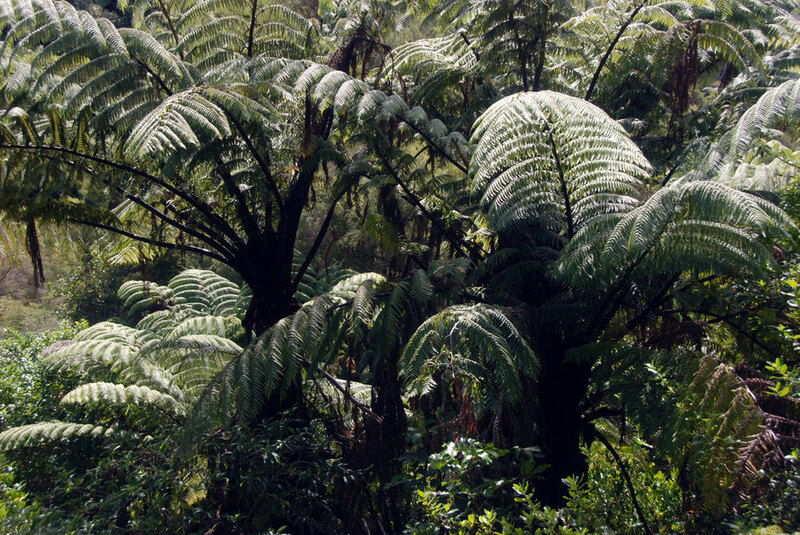 There are two main groups of tree ferns in New Zealand: Cyathea and Dicksonia. They are easily distinguished since Cyathea is scaly and Dicksonia is hairy. 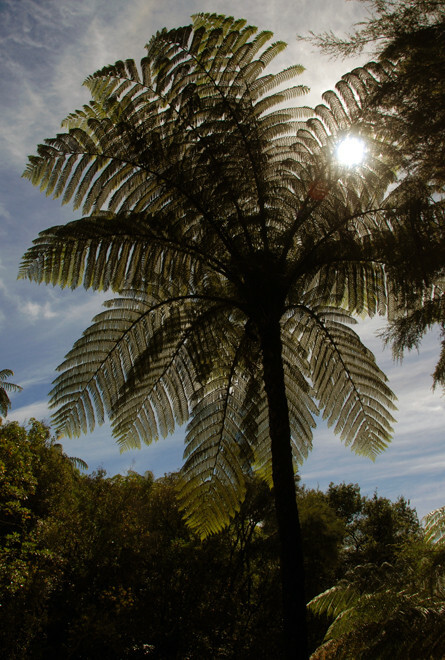 There are seven Cyathea species native to New Zealand of which five are endemic. Two species are confined to the subtropical Kermadec Islands: C. kermadecensis and C. milnei. There are three Dicksonia species native to New Zealand. 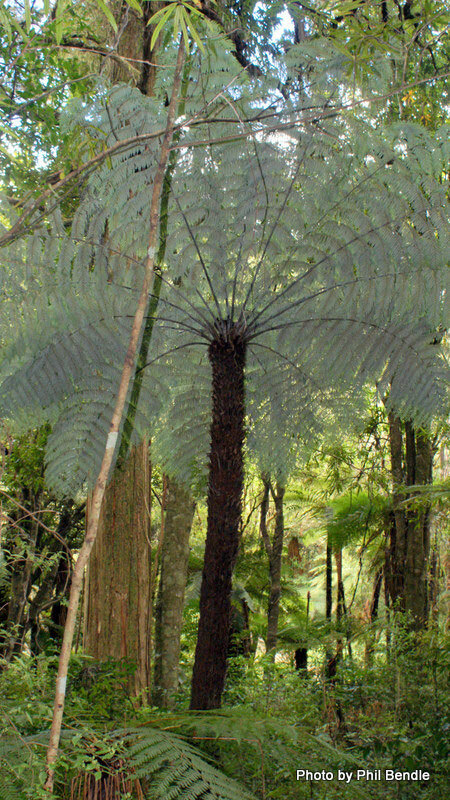 Additionally, New Zealand is the only home of Loxsoma, which is related to tree ferns but does not form a trunk. 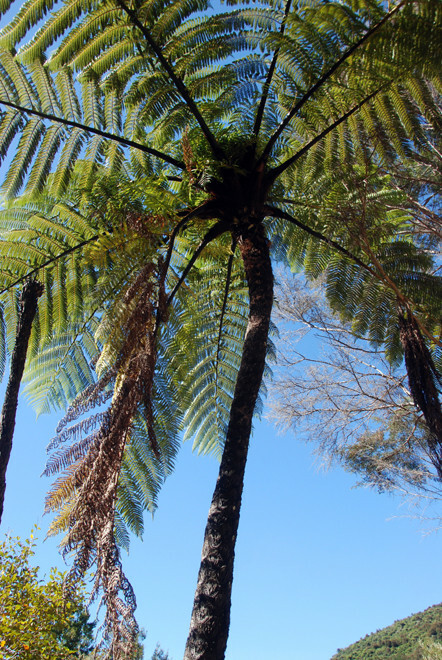 Tree ferns are colloquially known in New Zealand as “pungas”. 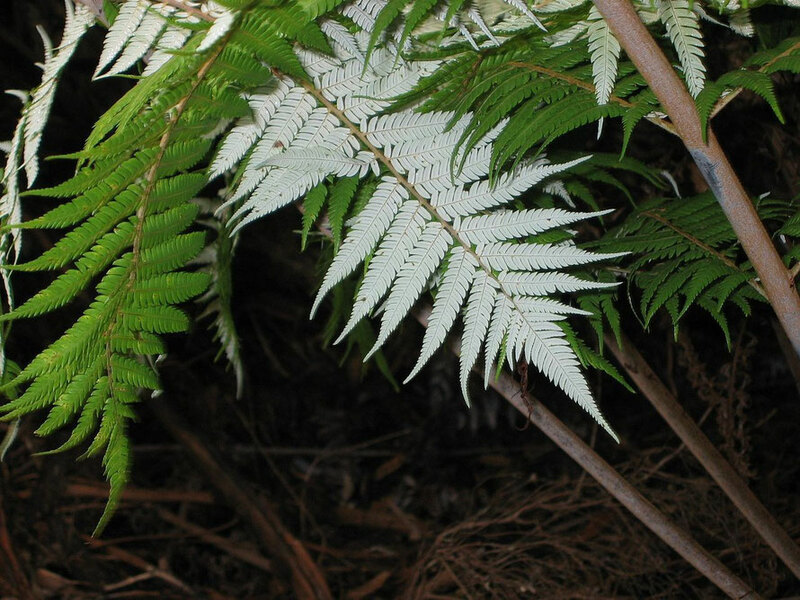 This appears to be an English corruption of “ponga”, the Maori name for the Silver Fern (Cyathea dealbata). 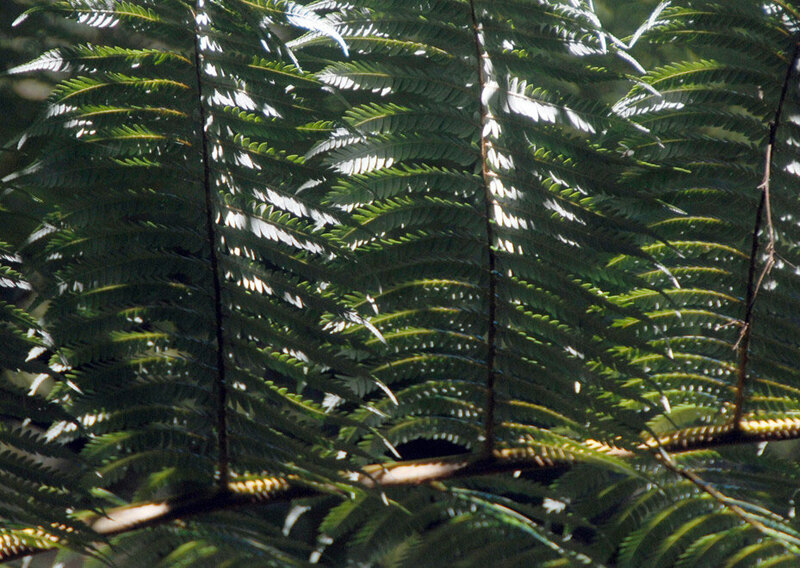 'Weki' is the Moari for tree ferns of the Dicksonia genera. 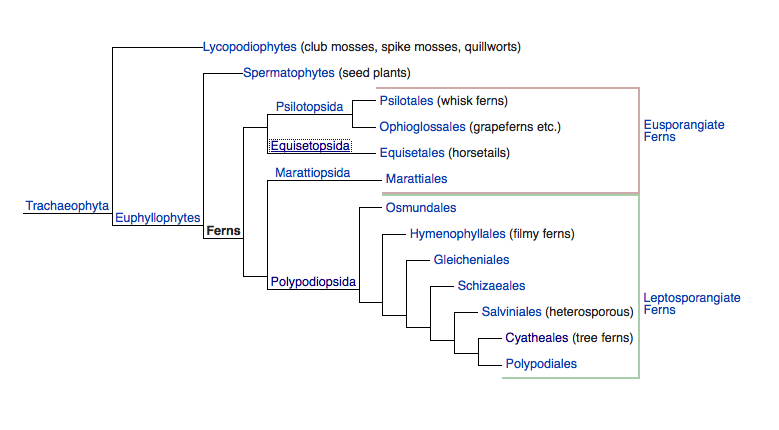 The consensus on the fern phylogeny(evolutionary tree of life) (to the level of orders - ie the Cyatheales Order of tree ferns) (from Wikipedia: Ferns). 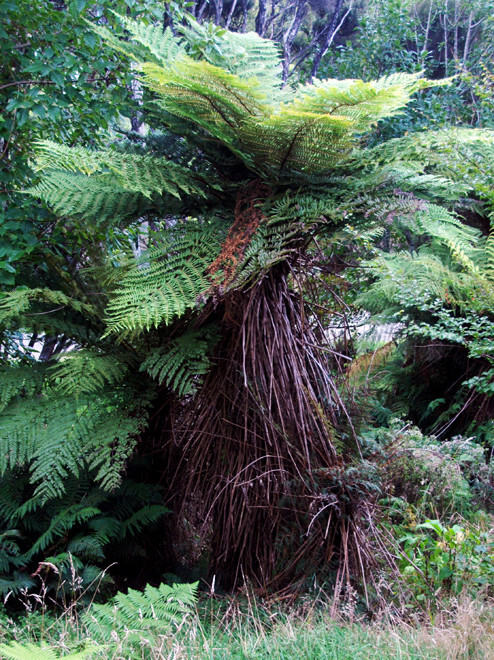 Tree ferns are vascular - (i.e. have water-conducting vessels) but have neither seeds nor flowers (as do gymnosperms and angiosperms) reproducing instead through the production of spores. Some tree ferns - notably the hairy wheki - can survive being chopped in half and sprout from the remnant trunk sections. They can also survive falling over and sprout from buds on their trunks. 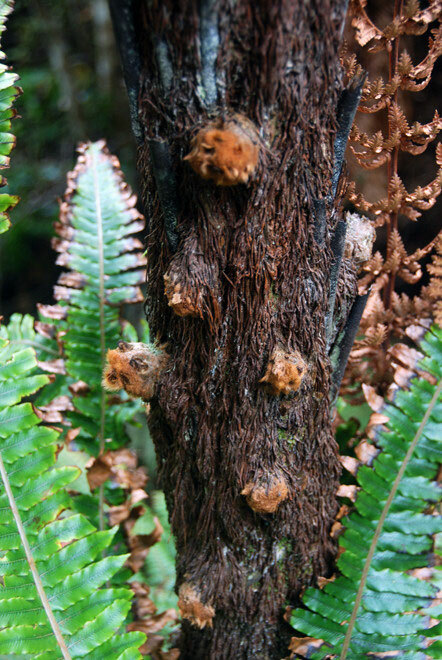 Buds on the trunk of a Wheki - D. squarrosa, Rakiura Track west of Lee Bay, Stewart Island. The buds can produce new trunks if the main trunk is knocked over onto the ground. 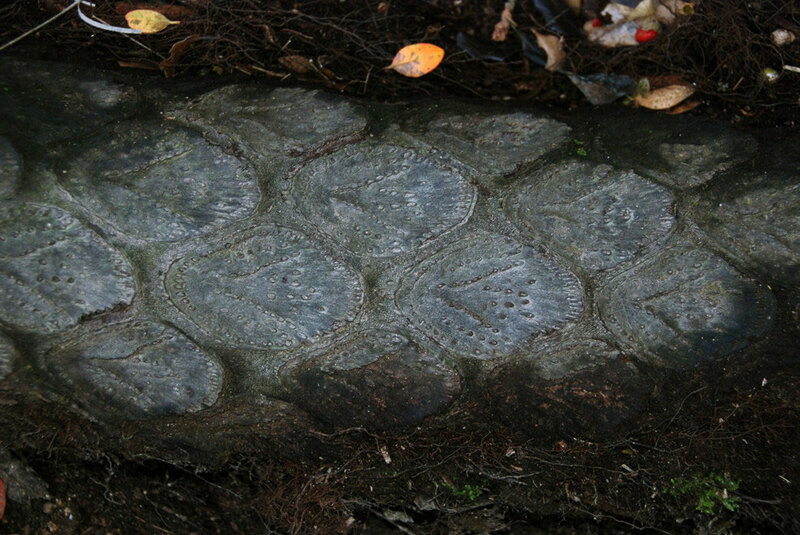 Worldwide there are thought to abe around 1000 species of tree fern. They are mainly found in tropical and subtropical areas, as well as temperate rainforests in South Africa, Australia, New Zealand and nearby islands. Despite being wind dispersed through their spores tree ferns tend to be very local and are vulnerable to micro-habitat loss. Tree ferns belong to the order Cyatheales which is a taxonomic division of the fern class, Polypodiopsida (which is the major fern class and comprises some 9,000 species worldwide). Possibly Maidenhair vine/pohuehue - Muehlenbeckia complexa - and an epiphyte (Tmesipteris tannenis - Hanging fork fern)growing from a tree fern stem (probably Silver Fern/Ponga) on the Hydro Walk, Golden Bay. Not unsurprisingly there are specific epiphytes that are particularly adapted to the shady conditions encountered under the frond crown of a tree fern. 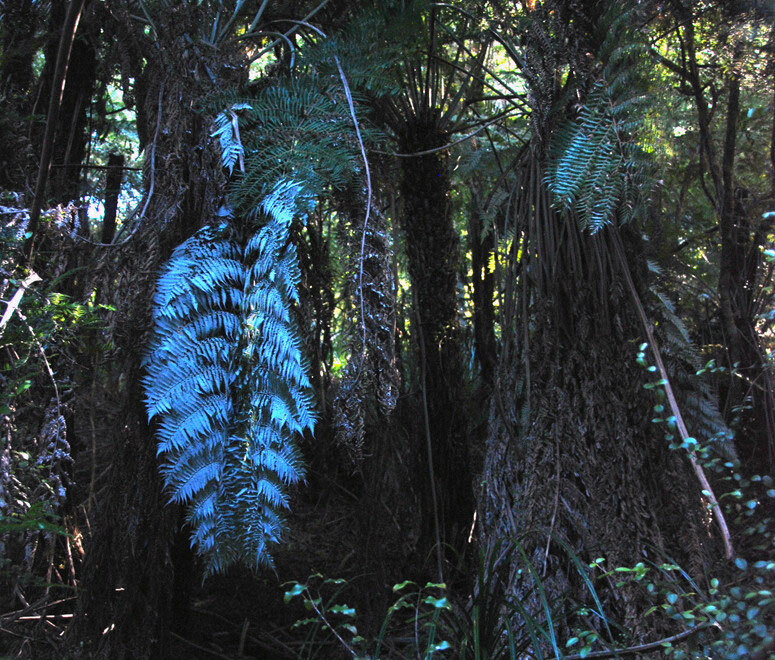 The Silver Tree Fern and the Wheki attract the most epiphytes as their trunks with decaying stipe ends collect soil and water to form nurseries for epiphytes. On the Mamuka (Black Tree Fern) hard leaf scars on the trunk 'form an armour-like surface unsuitable for epiphytes' and the Dicksonia fibrosa and Cyathea smithii form skirts of dead and dying fronds which are inimicable to epiphytic growth. As well as the specialists tree ferns in moist conditions attract a host of the more common rainforest epiphytes - lichens, mosses, liverworts and smaller and larger ferns and climbing ratas and other climbers. Perhaps the strangest epiphytic case is that of the kamahi (Weinmannia racemosa) - a dominant canopy species in montane rainforest. 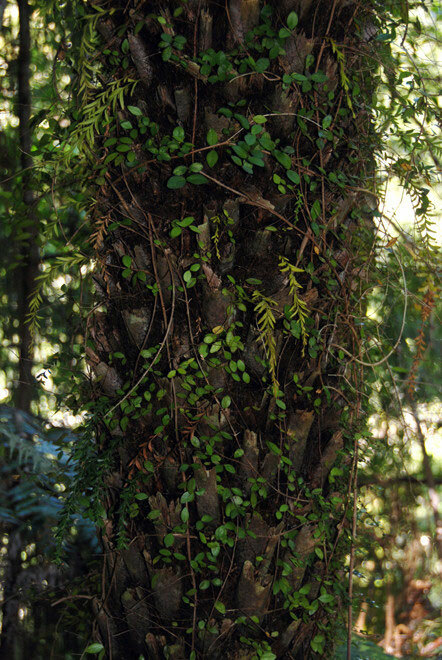 It often begins its life as an epiphyte on the trunk of a wheki. 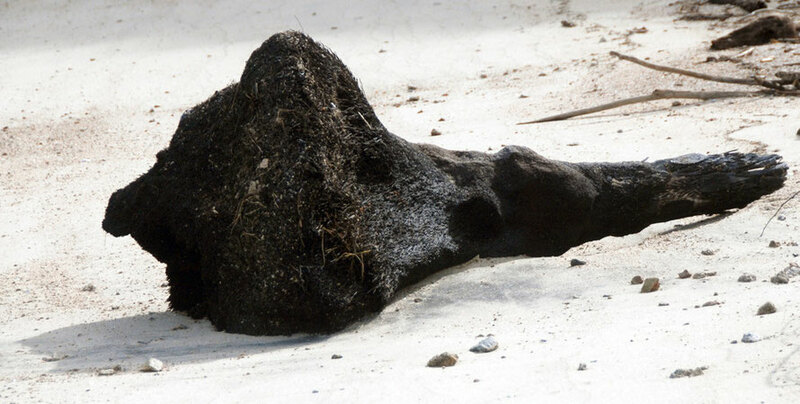 'The kamahi sends a root to the ground, which branches several times, but it doesn't seem to form girdling roots. 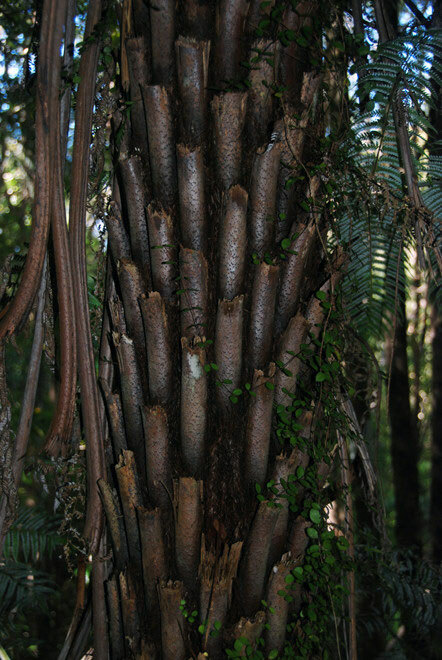 Instead it often sends a branch root vertically upwards within the tree fern trunk. 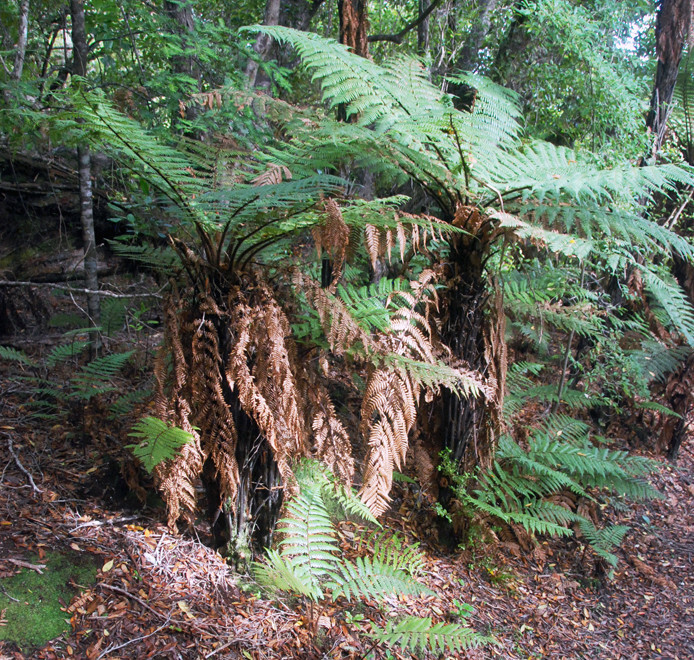 The tree fern continues to grow for a time, but eventually breaks off above the junction with the kamahi leaving a stump' (see Dawson, JW 1986 pp.65). 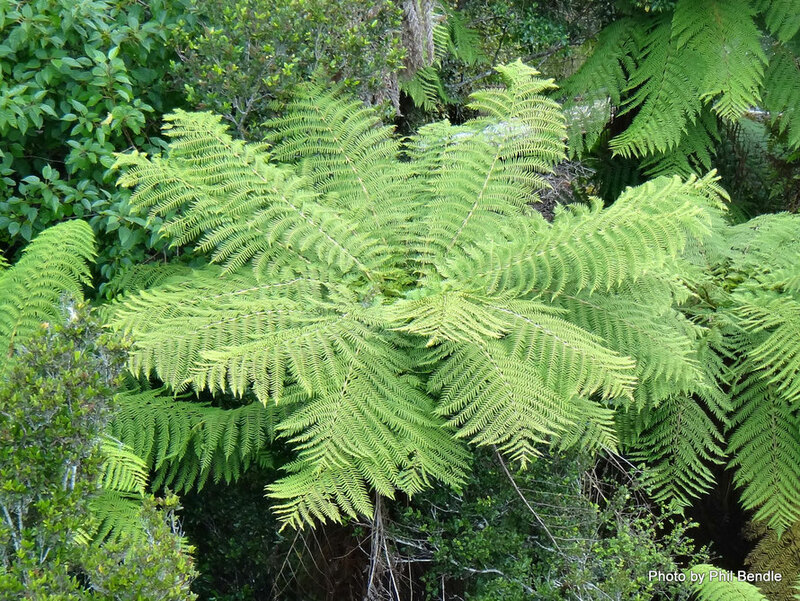 Close-bunched habit of weki/rough tree fern - Dicksonia squarrosa on the Rakiura Track west of Lee Bay, Stewart Island. 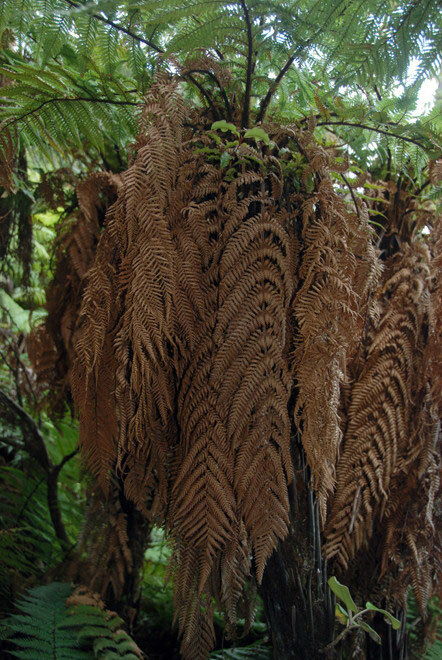 Tree ferns vary in their disposition with other plant assemblages. Some times they flourish above young regenerating forest. At other times they live within the permanent shade of thick semi-mature and mature forest. 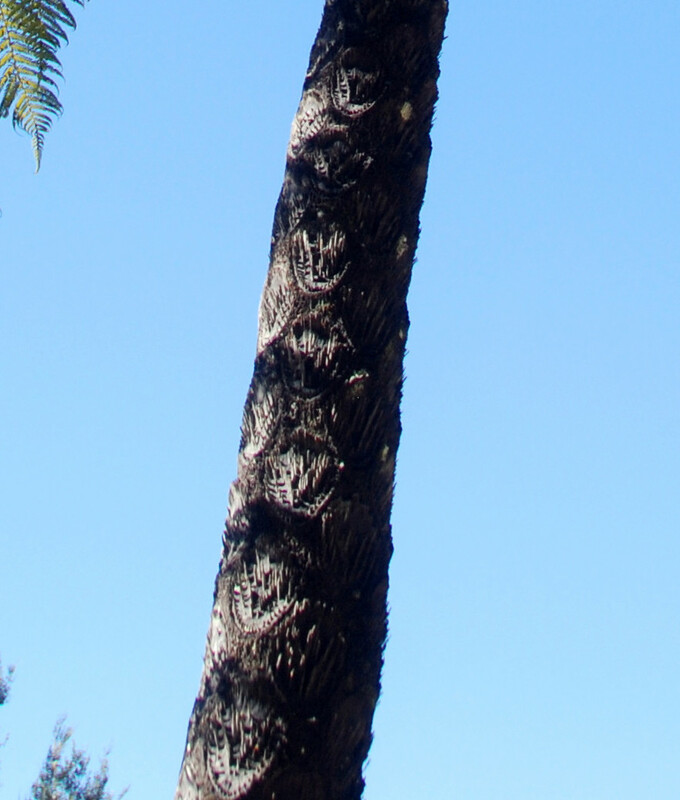 Some tree ferns are alarmingly stark with their black frond stalks (stipes), others dance on surprisingly elongated and thin trunks like a giraffe's neck. In deep bush close-growing colonies of tree ferns skirted by their dead fronds are like terracotta warriors, immobile and implacable. At their most glorious the luxurious foliage of hundreds of tree ferns catches the sun on a hillside, shimmering in the light caught on their multiple moving surfaces. And at night the underside of the silver fern frond comes into its own, appearing to generate light in the darkness. Because of their tendency to be in amongst the tangle and low light levels of bush and understory tree ferns are surprisingly difficult to photograph although this did not stop me trying. Sometimes they are poetically solitary and at others they are a great jumble of raggedy tops, untidy, voluminous rusty skirts surrounded by a great deal of rubbish on the forest floor. 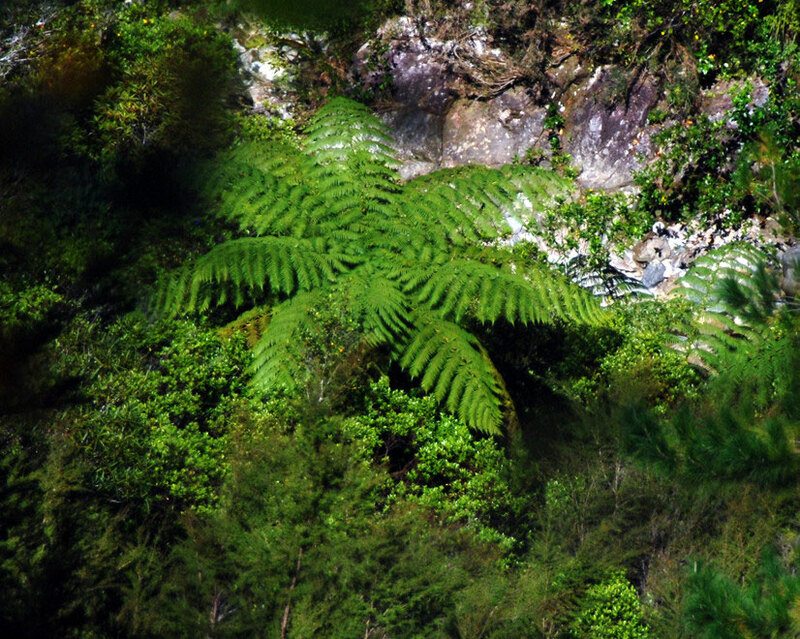 View from above of a tree fern in the bottom of the Campbell 's Creek valley, Hydro Walk, Golden Bay. Spied from above they are particularly pleasing in their umbellate form, their fronds reaching out into the space and light around them. Close up the hairiness of the weki (Dicksonia) is rather shocking - being redolent of a close-up view of someone's unguarded armpit. The trunks with their serried and decaying stipe ends, damp and home to tiny epiphytic creepers are mysterious. And dead on the sea shore the beautiful incised patterning of the stipe-scars on the blackened bristly stalks looks like something from an Assyrian relief carving in gypsum. 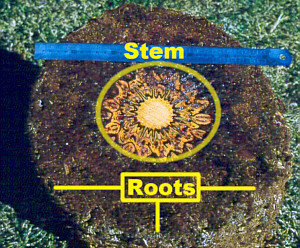 Tree root trunk (caudes) and chararcteristic marks where stipes (front stalks) have detasched from trunk. Probably Mamuka/Black Tree Fern (Wainui Bay, Golden Bay). Māori ate a number of ferns: the stems of underground bracken (Pteridium esculentum) and king fern or para (Marattia salicina), which was cultivated for its tuberous root. The young, curled fiddleheads (pikopiko) of many species are edible and were eaten as greens and the inner core of mamaku/black tree fern reveals a slimy pith that was cut into slabs and baked in a hāngī (earth oven). This removed the toxins from it. 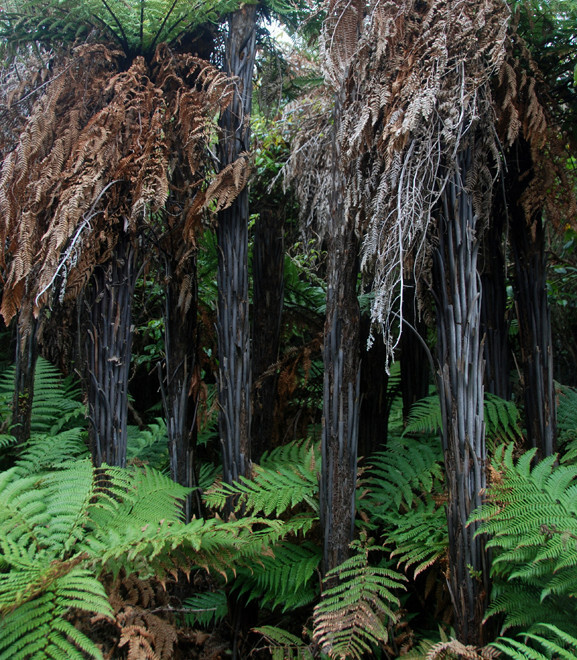 Tree fern trunks, particularly whekī (Dicksonia squarrosa)were used to build houses and food stores, as they are slow to rot and last well in the ground (Te Ara). 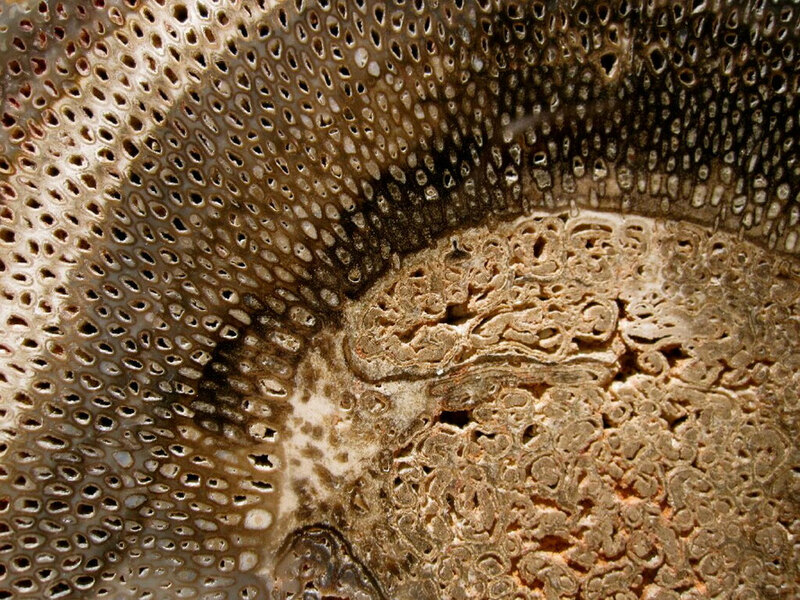 Cross section of fossilised tree fern from the Permian period growing in Brazil showing thick layer of roots and inner stem. (Click for link). Another tree fern caudes/trunk on the Wainui River waterfall walk, Golden Bay with distinctive v-shaped patterning on the stipe scars. This trunk is more weathered than the photo above. 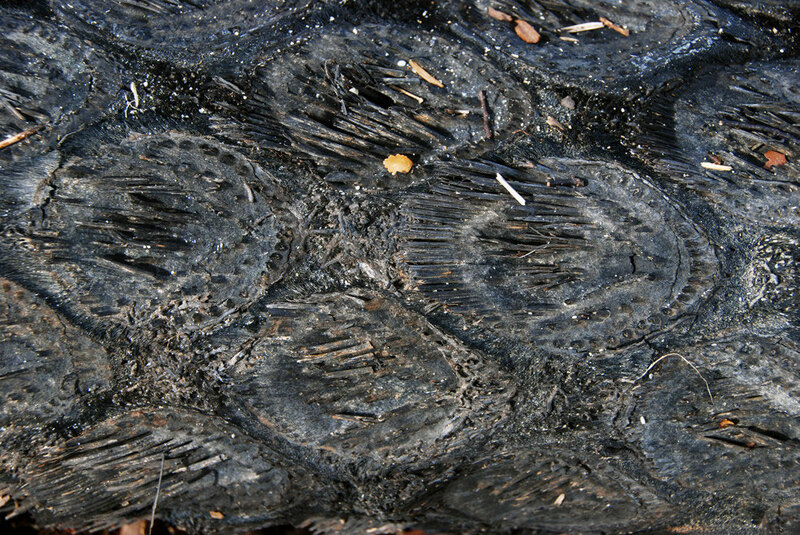 Tree fern stem made from grouped rhyzomes - washed up in Wainui Bay, Golden Bay. The hairy composition of the tree fern rootball/trunk base (Wainui Bay). Endemic. Recognised by its retention of dead frond stems as a ‘skirt’ around its trunk. 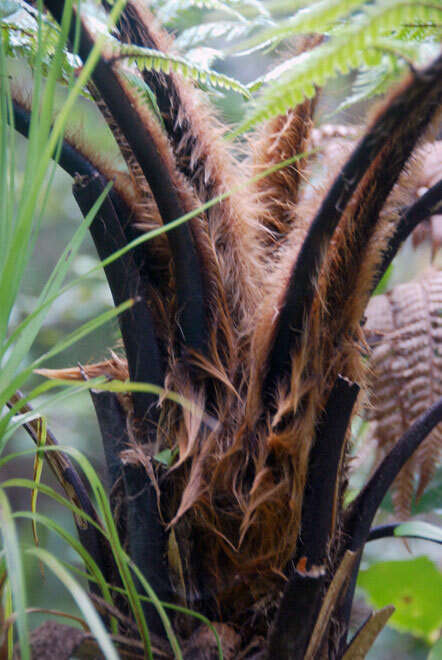 Dicksonia fibrosa also retains a skirt, but of the whole fronds rather than just the stems. C. cunninghamii has a clean trunk compared to the skirt of C. smithii. However, both species can have untidy skirts when young (even c. 2 m tall). Tree fern with green-stalked soft leaves to 2.5m long. Trunk to 5m tall, skirted by the remains of old leaves. Leaf stems covered in small red and white star-shaped hairs and pointed scales (lens needed). Seeds in small cups underneath leaves. Lowland to montane (mostly montane in northern New Zealand), in dense forest as a common subcanopy species, in wetter areas grows into in open scrub, gullies and valley heads. Up to 8 m tall, 50-150 mm diameter, covered with appressed, dark brown stipe stubs. Stipes slender, pale to dark brown, red-brown scales . Fronds up to 2.5 m long, delicate, horizontal, soft/very soft, delicate, top side dark glossy green, paler underneath. Large head. 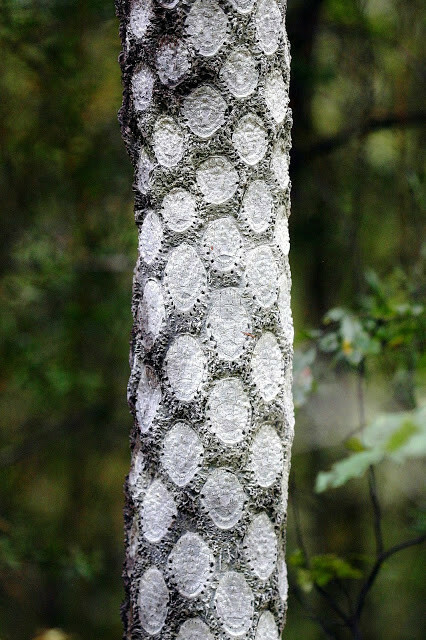 The trunk has chestnut coloured scales. 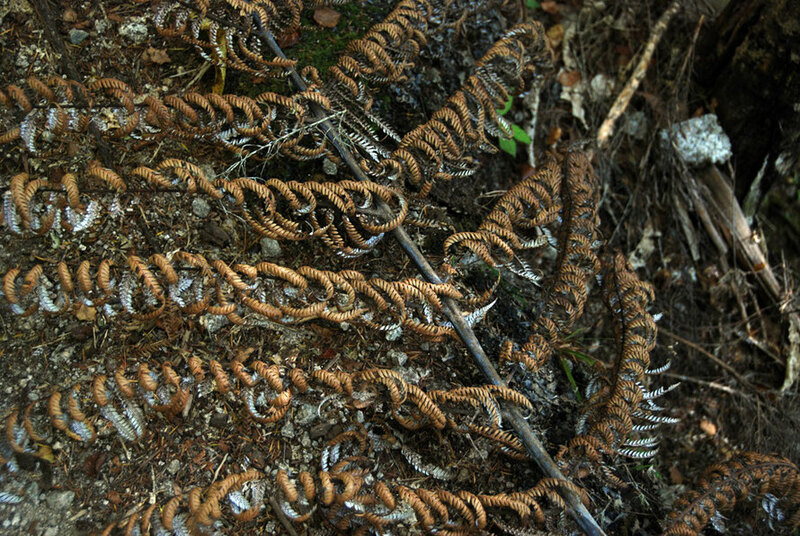 Midribs of dead fronds long persistent as a short skirt around trunk. Primary pinnae 250-500 mm long, under surface bears numerous red and white hairs. In the past Cyathea smithii was a food of South Island Maori tribes. They use to eat the cooked heart of this fern but the C. medullaris (Mamuka) was the more favoured for eating. Katote tree fern (Cyathea smithii) and Schefflera digitata (Pate) in foreground on Chalet Lookout path, Fox Glacier. Cyathea cunninghamii indigenous in lowland to montane forests (>1000m). North Island and South Island (northwest and western side). Also native to Tasmania, and eastern Australia. Tall slender brown trunk (6-20 cm in diameter). Up to 20m. Sheltered cool, humid, shady gullies and stream banks. Soft and delicate fronds 3m or more. Held horizontally with distal portion slightly decurved with the apex distinctly upturned. The old fronds persistent only on immature plants. Leaves small oval stipe scar. Coastal, lowland to montane in wet forests - especially along riversides, in gullies and in valley heads. An especially prominent species in karst country where it often fringes dolines and cave entrances. Damp gullies throughout New Zealand, more localised in South Island and Stewart Island/Rakiura. Reaches 20 metresin height. 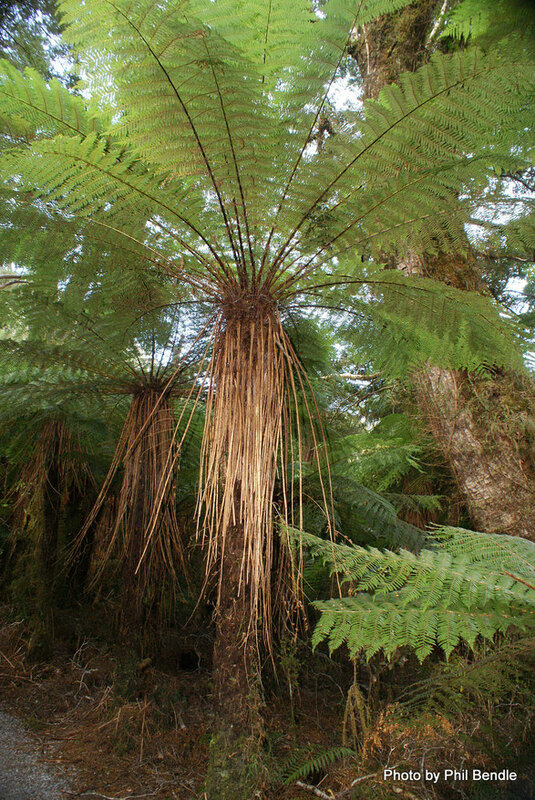 The fronds may be 5 m long, arching upwards from the crown. Dead fronds are shed except. The primary pinnae are 0.4-1 m long. 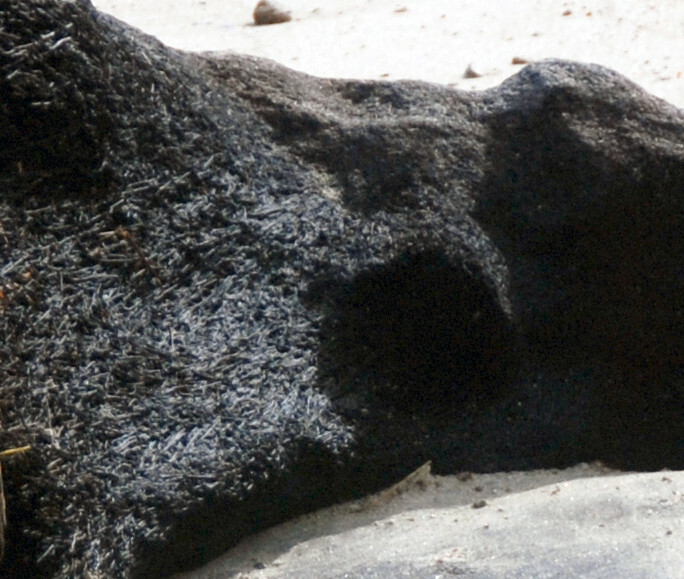 The stipes are thick, black, rough to the touch and covered in black scales with marginal spines. 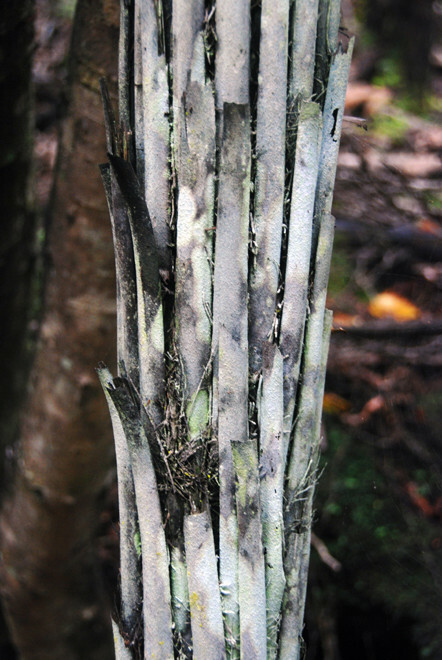 C. medullaris can be readily distinguished from related species by the hexagonal stipe scars on the trunk and by the scales with spines on their margins. Mamuka at the start of the Hydro Walk aboe the Waikoropupu valley in Golden Bay. Detail of manuka caudes/trunk above - from Hydro Walk. 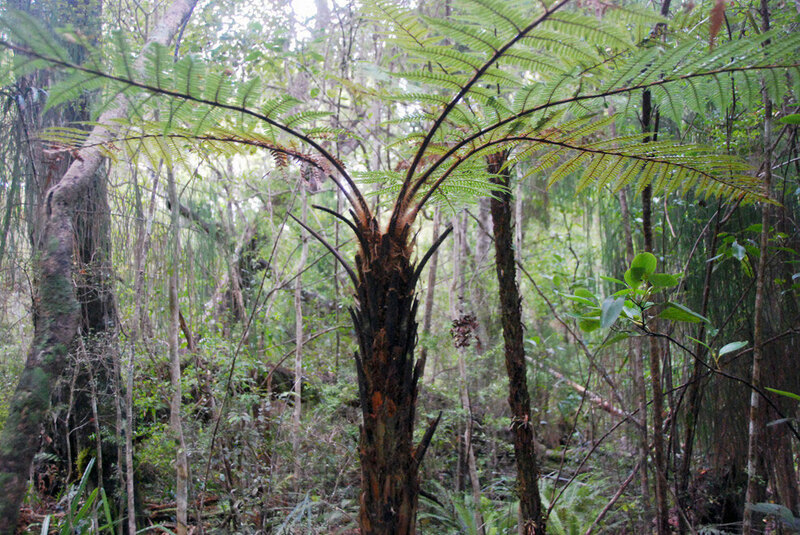 A medium-sized tree fern, endemic to New Zealand. grows to 10 m or more. Crown dense. Fronds about 4 m long with silver-white colouration on the undersides. Fronds light green top, silver bottom. Stipes slender, silvery-white when young, maturing pale brown. 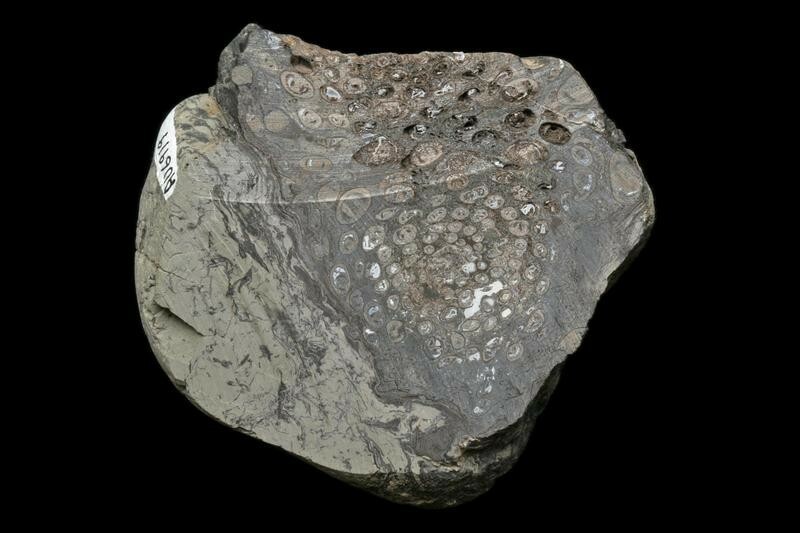 Arrived relatively late during the Pliocene epoch 5–1.8 million years ago. 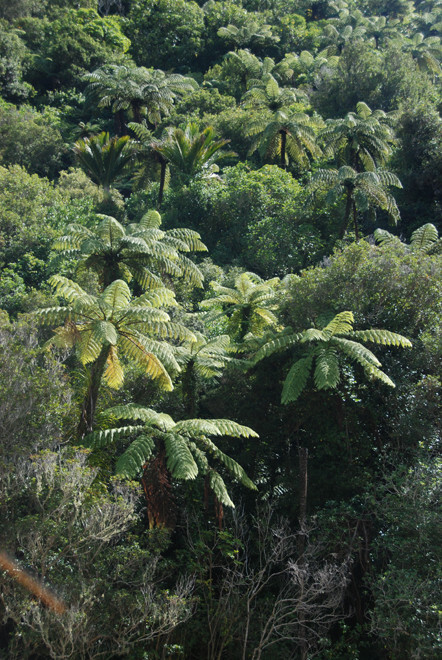 Occurs on main islands of New Zealand mostly as subcanopy in drier forests and open scrub. Does not grow under the dense canopy of mature forests (Wikipedia)'. Common, primarily coastal and lowland habitats up to lower montane. Prefers dry forest/shrubland/pines. Largely absent from Westland, Fiordland and Stewart Island. Note: All photos of trunks show stipe ends attached. They seem less perpendicular than the D. Squarrosa, arching away from the trunk. Underside of Silver Fern (Wikicommons-public). 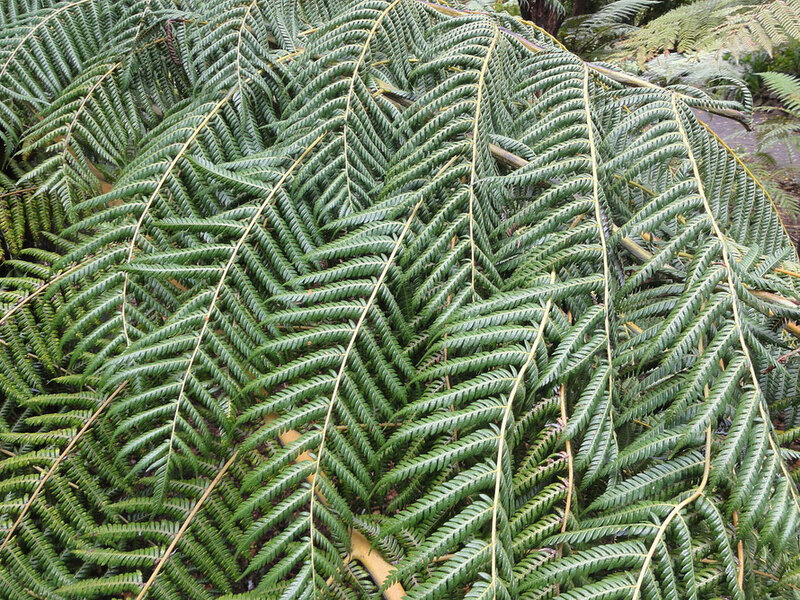 Silver fern/ponga - Cyathea dealbata - growing in a very shaded location on the north side of the Campbell VAlley on the Hydro Walk. 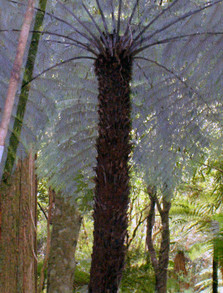 National symbol of New Zealand the upturned fronds were cut to mark pathways at night. Montane and subalpine forest and scrub - Bay of Plenty to Stewart Island. High altitudes in North Island - reaches lowlands in South Island. Resembles Cyathea smithii but no trunk. Trunkless Cyathea that are fertile (i.e., producing reproductive structures) - other species not fertile until considerable trunk developed. Common except in the coldest of habitats. Abundant around streams and other wet areas. Trunks often arise in close proximity. Dead orange-brown fronds give it a scruffy appearance. The trunks are not dense, and made up of persistent, dead, black stipe bases, interwoven with dark brown to black rootlets, and bearing aerial buds. Frond stalks bristly-hairy, dark-brown comparatively long. Cf D. fibrosa frond stalks shorter and green. Long and green/orange-brown in D. lanata; both without especially bristly hairs. Has buds on its trunk. Can resprout if the main crown damaged. D. Squarrosa - Hydro Walk, Golden Bay. The scruffy appearance of D. squarrosa - when is a skirt not a skirt. Buds on the trunk of D. squarrosa, Rakiura Track west of Lee Bay, Stewart Island. Widespread but only common in the central North Island. Prefers colder areas. Green, relatively short frond stalks distinguish it from D. lanata (frond stalks long and green to orange-brown) and D. squarrosa (long and dark brown). 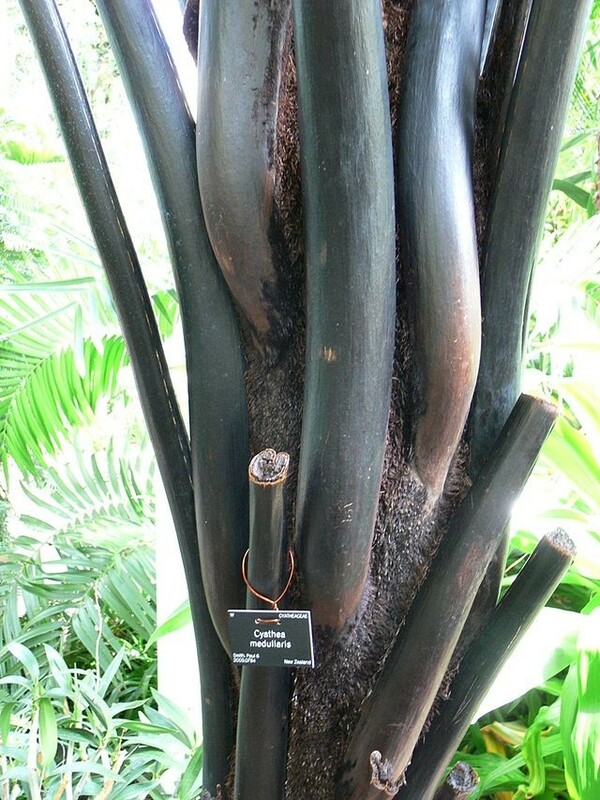 The trunk of Dicksonia fibrosa can reach a comparatively massive girth. Big trunk. small head. Big skirt of whole fronds. Tree Fern on the edge of the coastal bush towards Ackers Point, Stewart Island (Could this with its skiet of stipes but not fronds be the Katote/Soft tree fern (Cyathea smithii)? Through much of the North Island and on the nw coast of South Island. Common in kauri forests. In south more associated with colder habitats, vis beech and kamahi forest. Northern population has short max 2m trunk. Southern populations no trunk. Short/absent trunk distinguishes D. lanata from the other Dicksonia. Long, green to orange-brown frond stalks distinguish it from D. fibrosa (short, green frond stalks) and D. squarrosa (long and dark brown).